Sometimes a book can sneak into your consciousness, and warm the parts of you that you hadn’t even realised were cold. 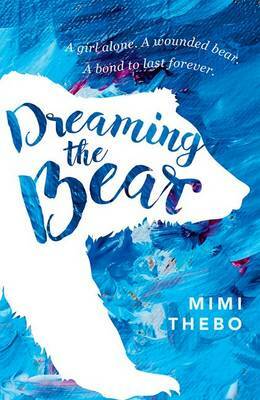 So it is with Mimi Thebo’s Dreaming the Bear, a story beset with snow and wilderness but very much rooted in contemporary life. Darcy is a British girl displaced by the careers of her parents to live far from the shopping malls she’s most at home in. Instead she’s struggling to get to grips with life in the winter of Yellowstone National Park America. We meet Darcy when she’s recovering from a bout of pneumonia and is trying to build up her strength though daily walks recommended by her doctor. Everyone is busy, so she goes alone, grumbling inwardly about boredom, tiredness and missing everything she’s left behind in England. As frustration takes hold she decides to climb a steep hill, something she’s been warned against as her lungs are still “crinkly and wet” from her illness.